This was another hit and miss episode of Impact Wrestling, there were some good storyline developments and decent in ring action but at times some horrible jumps of logic that made the show difficult to watch. TNA seems to still be finding it’s feet with it’s new format, and whilst it is going to take time, I’m not sure it’s time TNA really have. The show kicked off with new X-Division Champion Austin Aries making his way to the ring. Aries cut a pretty good promo about him winning the X-Division belt last week and how he would defeat Bully Ray for the World Heavyweight Championship, before calling out General Manager Hulk Hogan. For me, Hogan’s promos over the last few months have steadily been getting worse, repeating things he said last week or even in the same promo. Hogan revealed that Aries would have to defend the X-Division belt in tonight’s main event. For some strange reason, TNA has decided to keep TJ Perkins under the Suicide gimmick, despite showing him last week, simply renaming him Manik. I’m glad the name has been changed, as Suicide was always a little awkward, but would much rather have seen TJ Perkins have a run on his own. The other opponent would be Chris Sabin, who cut an empassioned promo detailing how he would win back the belt, in what is probably the best I’ve seen out of Sabin, especially in his latest run. There were a number of backstage segments involving Aces and Eights leading up to the match, with them discussing who they wanted to win. Some really poor acting on display from Wes Brisco and DOC here and it all seemed extremely forced. Bully Ray eventually asked “What would happen if nobody wins?” Well, in another piece of TNA logic, surely if nobody wins, then Austin Aries retains the championship and faces Bully Ray at Destination X? Did anyone think this through at all? The Main Event Mafia also revealed that they would be there to counteract the presence of Aces and Eights at ringside. With Aces and Eights about to head to the ring, DOC was seen attempting to get into the good books of Bully Ray, before Mr. Anderson overheard and it was revealed there would be a club vote next week for the Vice President spot in the group. With Aces and Eights standing in the crowd, the match rarely embraced it’s three way concept instead opting for varying combinations of one on ones with each man getting taken out. The action between the three was good and exciting to watch but would have been a lot better if it had played with the three man psychology of the match type. After Sabin has given Aries a painful looking front suplex onto TNA’s hard ramp, Aces and Eights made their descent to ring side, with Knux getting involved with Manik by grabbing his ankle. Manik tried to take on Aces and Eight but received a powerbomb from DOC onto the outside, in possibly the strongest Aces and Eights have looked over the past couple of months. With Aces and Eights surrounding the ring, the Main Event Mafia headed out to combat the threat. With Manik carried out of the match, it was basically down to a one on one between Chris Sabin and Austin Aries, this is where the match really got going. Aries and Sabin put on a match that really advertised the style of the X Division well with some great action from both men. Aries dominated Sabin for a lot of the match, and looked to have retained the title on a number of occasions, including kicking out of Aries’ Brainbuster and spending a long time in the Last Chancery. For me this really helped to build Sabin as a legit competitor, fighting hard against a former World Heavyweight Champion. The ending saw Aries go for a Brainbuster from the top rope, only for Sabin to reverse and hit a Super Hail Sabin for the victory and to become a six time X Division Champion. Many may criticize Aries having a one week title run, but the fact of the matter is it elevated Sabin and made him look a lot more credible than he had previously, personally I enjoyed this story over the last two weeks. Will Sabin defeat Bully Ray for the title? Probably not. Will he come out looking better than he did when he first won the X Division belt? Almost certainly. Our first glimpse of the Main Event Mafia on this week’s Impact Wrestling saw them arriving in the parking lot, with Kurt Angle announcing that a new member of the group would be revealed tonight. I think the reveal of the Mafia member being more of a slow drip than a sudden reveal has really worked with it keeping the attention for longer and not burning out quickly, which is something TNA needs to do now that there are only four PPV’s to build to. It has also started to build up to the confrontation between the Main Event Mafia and Aces and Eights fairly well, with both sides beginning to look stronger than they did a few months back. Later on in the night, Sting and Kurt Angle came out into the arena, to talk about why they choose Samoa Joe to join them. Their reasoning didn’t make a lot of sense, with them saying that the last group didn’t have good unity because they had former World Champions and there was I thinking that not only was Joe a former World Champion, but he was also in the Main Event Mafia before! It wouldn’t have been difficult for Sting and Angle to put over Joe as someone who had been held down in the past and that the Mafia will always help out a brother. Joe did a much better job on the mic when he came out, giving an impassioned promo, detailing how he was going to win the Bound For Glory Series and how he would tap out Bully Ray to win the World Heavyweight Championship once again. It’s easy to get behind someone like Joe as it’s clear he loves what he does and seeing him held down over the last couple of years, would make him winning the World Title a really poignant moment for any long running TNA fans. Angle then did a good job of getting Joe even further over with the audience talking about their battles against each other in the past and how that respect had turned into loyalty. This made a lot more sense than what was said previously, and felt like it came from a much more legitimate place. Angle then announced who the next member of the Main Event Mafia was….Magnus. Angle did another good job of getting Magnus over, saying he was the here and now of Impact Wrestling, rather than just the future. Magnus came out and cut a pretty good promo, talking about his fellow Main Event Mafia stablemates, especially Samoa Joe. Personally, I think Magnus is a pretty good choice for the Mafia, Magnus will get a lot from being involved with the other men in the group if booked properly. Magnus has to seem like a strong member of the group, if he becomes an afterthought like we’ve seen with DOC and Knux in Aces and Eights, it could do more damage than good. 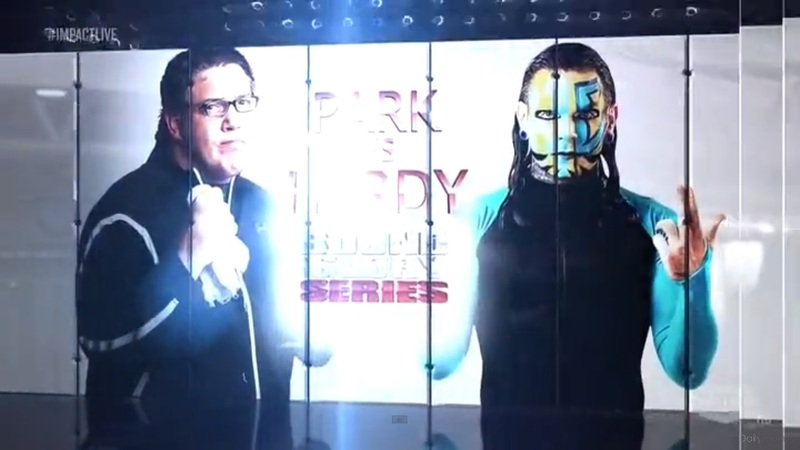 Elsewhere, the Bound For Glory Series continued with Jeff Hardy facing Joseph Park. On paper this match doesn’t sound particularly exciting, neither does it sound like it would have drawn in the ratings. However, it actually managed to tell a decent story and was pretty fun to watch. It looked as if Hardy would win early after a Twist of Fate, but with Park moving out of the way of the Swanton Bomb, the match quickly changed, with Park using his power to push Hardy around. 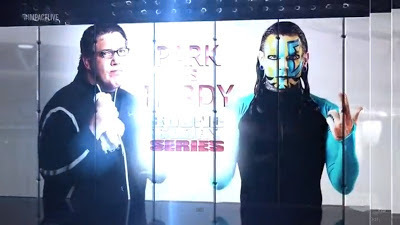 Hardy did a good job of making Park look credible, whilst Park has also improved in the character looking less of a bumbling idiot making his matches easier to watch. The ending saw Park’s lip cut open after a Whisper in the Wind from Hardy, with Park suffering a similar metamorphosis that we’ve seen from him a lot over the past year, hitting the referee with a Black Hole Slam for the Disqualification loss. That give Hardy an extra three points in the Series, whilst Park losses ten for the DQ. It would appear that TNA is finally going to have Park revealed as Abyss and not without time either. Hopefully we’ll see Abyss flying high in the Bound For Glory Series before long. It would also seem they are holding Hardy back in the Series as it would have been easy to have him pick up seven points here, but the DQ victory keeps him looking strong but unable to climb to high in the Series. 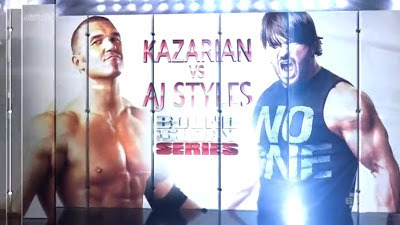 In another Bound For Glory Series match, Kazarian faced AJ Styles. With Christopher Daniels joining Kaz at ringside, Bad Influence came out dressed as Sigfried and Roy seemingly to wind up the Las Vegas audience, if anyone can pull off these bizarre comedy costumes, it’s going to be Kaz and Daniels! The match between Styles and Kaz was of course another good contest out of these two, but suffered heavily from the curse of the Bound For Glory Series, time constraints. This is the kind of match that should be getting at least fifteen minutes, not four. AJ eventually locked in the Calf Killer in the middle of the ring, to pick up the submission victory and ten points in the Bound For Glory Series. AJ Styles is still my favourite to pick up the victory of the entire series, but he needs to be showcased in longer matches, to build up that victory better. The other Bound For Glory Series match, saw Hernandez face Jay Bradley. I’ve been pretty impressed with Bradley over the last few weeks and this matches was another decent contest. Bradley had some good periods of offense and seems to be developing his character well during the Series. Hernandez also seems to be coming into his own, and it seems a much deserved singles push could be on the way. The ending was intriguing with Chavo Guerrero, who was at ringside getting involved by hitting Bradley behind the referee’s back, allowing Hernandez to get the victory and seven points in the Series with a Shoulder Tackle. Okay, the Shoulder Tackle was a terrible way to win, but with Chavo seemingly turning heel, the forthcoming rivalry could be a star making one for Hernandez. Knockout’s Champion Mickie James also made an appearance to talk about next week’s Number One Contender’s Ladder Match between Gail Kim and Taryn Terrell. James gave a very strong promo whilst sitting a top of a Ladder. She’s really grown into her new heel role, which is definitely good to see, it feels fresh for the character and gives her a different set of Knockout’s to feud with. James talked about how whoever won the Ladder Match, would get there face broken on every single rung of the ladder afterwards. The logical winner and eventually rivalry for Mickie James would be Taryn Terrell, and I think the two would develop a really interesting story, with James hopefully being able to teach Terrell even more than she has learnt from Gail Kim. World Tag Team Champions James Storm and Gunner were also in action against The Bro-Mans, who were accompanied by Tara. The match was over pretty quickly, after Robbie E and Jessie Godderz worked over Gunner until he made a hot tag to Storm in a pretty basic tag team contest. Storm cleaned house, alongside some good double team manoevers for the World Tag Team Champions, including a nice neckbreaker-slam move on Godderz that gave them the victory. This match allowed Gunner and Storm to look pretty good, but with little in terms of a tag team division I really can’t see who is going to challenge them for the titles. The Gutcheck judges also decided the fate of last week’s contestants Ryan Howe and Adam Ohriner. After last week’s round of releases by TNA, including a number of former Gutcheck winners, the whole concept feels kind of obsolete with no evidence that winning Gutcheck get’s you very far in the company. Ohriner was the first eliminated by Al Snow, Bruce Prichard and Danny Davis, giving Ryan Howe the opportunity out in the arena. After receiving a no vote from Snow, Howe attempted to “Kick Out” delivering a pretty decent promo, but after a Yes from Danny Davis, Bruce Prichard sealed Howe’s fate with No Vote. Pretty much, how I saw it going, neither Ohriner or Howe offered much to TNA and it was the right decision all round. 1. TNA are capable of clever booking, with the past two weeks of X Division booking really helping Chris Sabin look like a star. 2. The Main Event Mafia no longer needs to contain former World Champions. 3. It can't be long before the reveal of Joseph Park being Abyss.